Uh…OK, the Motiv United Revolt is pretty darn strong. I personally haven’t thrown a Motiv ball this strong at the end of the pattern. I like it! 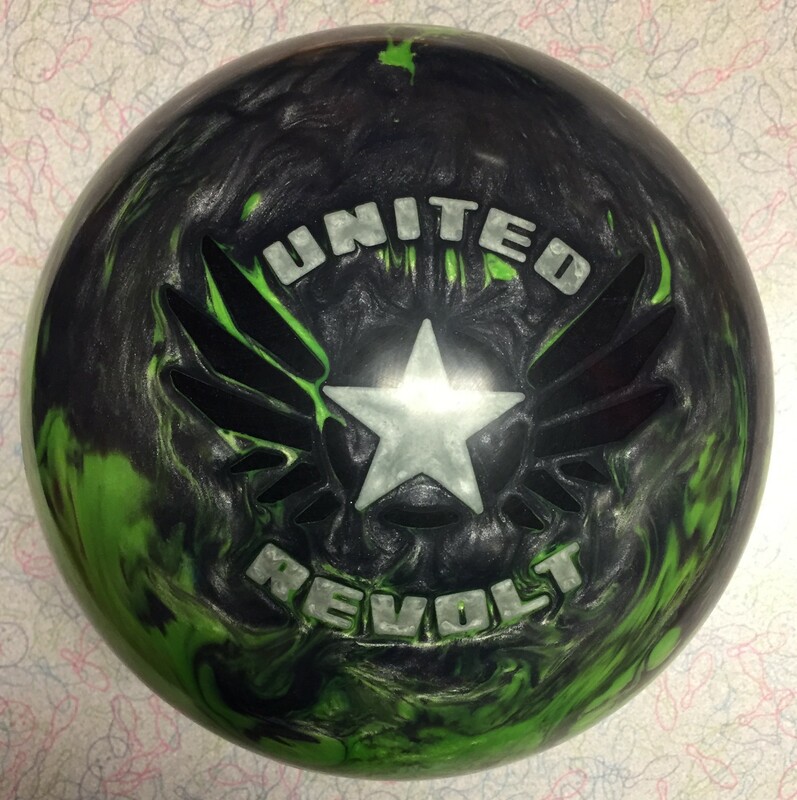 The Motiv United Revolt is mid-high priced bowling ball. With that said, being a pearl with a heavy rolling core will allow this ball to be used more frequently by bowlers on typical conditions and thus a decent value offering. The United Revolt continues using the low RG Vanquish symmetric core with a new Helix™ HFP Reactive coverstock. Studying what manufacturers say they expect their equipment to do is something we look at to see if it matches what we see. In this case, Motiv places the United Revolt in their Medium-Heavy Oil range smack dab in the middle. For context, the Primal Fear is to the right of it claiming more angularity and the solid Chronic Paranoia is in the middle right underneath it in the Medium Oil range. My first instinct when throwing this ball was that regardless of the chart, it should be in the far right “angular” category. For me, it looked nothing like the Chronic. The United Revolt is pretty clean through the heads and mids as you would expect for a pearl coverstock and then makes the strong turn towards the pocket in the space remaining to the pins. We found the United to be aggressive off the spot, an interesting twist for Motiv. Nevertheless, it still continuous through the pins. It rolls heavy as we have come to expect from the Vanquish core. Starting with the lefty, I really got comfortable with the United Revolt quickly. That clean look of the pearl was welcome on the THS while the strong movement downlane made sure it not only made it back to the pocket but drove through the pins. I had decent forgiveness with this ball on this pattern. I tested the typical THS breakpoint of around 7 as well as further out, no problem. Tried with my baseline rotation and then less to play a bit more direct, no problem. I really liked the United Revolt. Compared to the Trident, you can clearly see where they separate. The Trident rolls about a foot earlier and with really heavy continuation. The Trident has a bit boomier smoother motion compared to the United Revolt which makes sense if you consider the United a step down. Comparing to the Venom Cobra, the Cobra is clearly another step down, differentiating nicely. The United is several boards stronger overall as well as stronger downlane motion. Sean is our second tester. With his high rev rate and low tilt, you can instantly see how strong the core is along with the coverstocks quickness to react to dry boards. Sean had to get this ball going well away from the pocket for it to come back. The ball looks like it’s in the roll phase quite quickly upon transition but man did it go through the pins! The further he edged towards the 4th arrow, the more he can afford to get closer to 7 board at the breakpoint but the ball seemed to have tons of energy. Sean compared the United Revolt to the Venom Shock. Playing the same line, the Venom Shock was at least a foot earlier. With it’s solid coverstock, it just doesn’t get the same length as the United. He would have to change his angles to get the Shock through to the same breakpoint simply because of the amount of friction. Finally Greg Bickta, our pro shop partner was our third tester. He was able to park between the 3rd and 4th arrow and comfortably throw the United Revolt. With Greg’s bit of tilt, it seemed to roll much smoother for Greg off the spot than for Sean who has very little tilt. That bit of added smoothness opens the comfort zone more for a bowler. It was that recognizable Motiv roll for Greg, like a nicely worn in pair of shoes. Being a pearl, you expect the reaction can be a bit more finicky on fresh shots. For me, misses in really didn’t hold for the most part but that massive tug into the oil can still flush the pocket on your typical house shot. The ball in out of box surface didn’t blend release variations as much. That could be good or bad. Good if you if are trying to accomplish something specific, bad if you just have an inconsistent release. You can change the surface to blend that more. For Sean, he had to really force it outside for it to die, otherwise it came back all the time. Misses in just stood up through the headpin. For Greg, it was typical miss reaction for him. If he gets fast, the ball blows through the breakpoint. But the ball had an overall great look for him. The Motiv United Revolt is a really nice addition to the Motiv lineup. It seems that depending on the bowler type, you will see some variation. For Sean and I, this is a pretty angular piece. For Greg, it was placed where Motiv says it is, in between angular and smooth. Nevertheless, all 3 of us saw a clean look to the breakpoint with a strong move off the dry boards and good motion through the pins. I always suggest to use the strongest core you can to take advantage of the heavier hit. This ball will allow you to use a strong core with a cleaner coverstock to do just that. A lot of people will be able to use this on their THS and that is good for performance and value.